shipping of this new player is on the way, many of us are waiting their delivery. I got my UB820 last week and still testing. So far I am very happy about my purchase. I am using it directly connected by hdmi to a Sony Oled KD-65A1 and picture quality is stunning. Can't say about audio quality since I still have to build a Home theatre audio system in this new house. Hope to talk soon with other owners. If anybody has any question about the player, feel free to ask! WOLVERNOLE, mattg3, tigerhonaker and 4 others like this. Last edited by Giak; 07-20-2018 at 04:45 AM. Any word on if the Dolby Vision update is live yet? The update will be on fall. Giak, thanks for starting this thread. Like many others, I've been waiting for more details about this player to learn if it suffers from the same reported user interface problems that the Sony UBP-x700 has. "First, unlike other Dolby Vision-capable source devices, an updated X700 can’t automatically detect whether the source you’re watching is playing in HDR10 or Dolby Vision. You manually have to switch its Dolby Vision mode on via the player’s set up menus when you want to watch a DV source." "The lack of auto Dolby Vision/HDR10 switching is arguably even more of an issue with the X700's VUDU and Netflix apps. The thing is, these services carry a mixture of non-HDR, HDR10 and Dolby Vision content. Yet in Netflix’s case in particular, you only get a notification on its menus if a title is available in Dolby Vision if the app detects that it's running on a Dolby Vision-capable device. So with the X700, most users won’t be able to tell if a show they're interested in is available in Dolby Vision on Netflix unless they manually switch the X700’s Dolby Vision mode on to check if the header information for that show changes to say Dolby Vision." "Even more clumsy is the fact that if you activate the Dolby Vision mode on the X700, everything you play on the deck is output to your TV behind a Dolby Vision flag. As a result, even standard dynamic range HD Blu-rays and DVDs are presented to your TV as Dolby Vision sources. Which triggers your TV to go into Dolby Vision playback mode, resulting in pictures that look much brighter than they’re supposed to." "Thanks to this inability of the X700 to automatically switch in and out of Dolby Vision mode, you can’t just switch the mode on and leave it at that. You really are going to have to manually keep toggling DV on and off, with all the faff and potential for missing Dolby Vision sources that entails." It may be too early, but can you please comment on whether or not the Panasonic DP-UB820 suffers from the same issues? It won't get the Dolby update until the fall. When it does, I seriously doubt it will have this issue like the Sony and initial ATV update. After reading extensively about this player I took the plunge and sold my Oppo 203 and pre-ordered the UB820 via VE. I have always been a fan of Panasonic Blu-Ray players and really think this player will be a great fit with my JVC E-Shift projector. Should give the Oppo a run for the money. Will report back after I get my player. I had the Oppo since December 2016 so I have a lot of hands on exeperience with the player and different PQ settings and options. WOLVERNOLE and Ronman79 like this. The Oppo is a very good unit. What about this player caused you to decide to trade it in? I have a 103 and love it. The 203 reportedly finally got its DV firmware upgrade and now you have to wait for one again. Just curious. 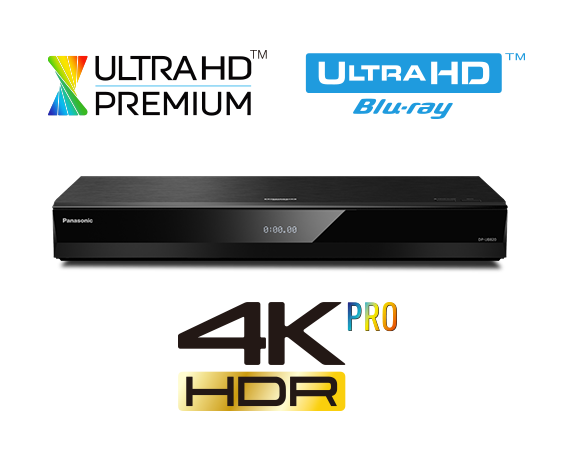 Since the 203 is no longer being made.....I will probably upgrade to the Panasonic 820 or 9000 at some point in the not too distant future. DV is of no concern for me right now since I have a projector and will continue to use projectors for many, many, years. I doubt any projectors will truly meet DV requirements for many years to come, and when they do, they will likely be well out of my price range. I loved the Oppo. When I bought it (Dec 2016) the only other player on the market I would consider was the Panasonic UB900 which cost more than the Oppo and seemed to have less features. I was using an Xbox S but wanted a dedicated player that had good 4K playback options and solid upscaling. The Oppo fit the bill. I have used it since mid December 2016 and enjoyed it, but I really don't use it for SACD or network streaming. So, essentially, 4K/UHD and 1080p Blu-Ray is about all I am using it for. When you look at what used Oppo 203's are selling for and the fact that Oppo is leaving the market I decided to sell the player, buy an 820 (which should equal if not best the Oppo for 4K/Blu-Ray playback) and use the rest of the Oppo money for some other home theater upgrades. I like the Oppo, but in all honesty, I just was not using all the bells and whistles and I really like what Panasonic is doing with their 4K players and the fact that they will continue to make new product. Seemed like the best time for me to make a move. I won't be excited about this player until I hear confirmation that the dynamic HDR Optimizer works with a JVC projector on both the low and high end when a disc has HDR10+ or Dolby Vision capability. I've heard this is an issue. Projectors can't do HDR10+ or Dolby Vision, so there's no added value to the 820 versus the 900 (which I have and like very much) other than dynamic tone mapping of the underlying HDR10 layer. Someone on Blu-Ray.com told me that they were able to turn HDR optimizer on while using their projector and were able to max out contrast setting without having any clipping. Wouldn't this be a big benefit to dim HDR picture projectors produce? I'd really like to see some screen shots of someone that has a projector and the UB820 with optimizer on ASAP. The results of the optimizer look amazing with HDR10 4000 nit movies. The thread in on blu-ray.com has a couple screen shots showing how effective the roll off is without altering the color or brightness of the rest of the scene. Cant wait for mine from Robert at Valueelectronics. Nice intro price of $500 from them. I've seen another site offering pre-orders at $600. WOLVERNOLE and Craig Peer like this. NVIDIA SHIELD TV 2017 / PANASONIC UB820 UHD PLAYER / MAudio BX8a front mains / Klipsch R‑15PM rear left/right / Emotiva C1 center / Polk Audio OWM3 height left/right. I thought about this player even though I have the Oppo 203. I do own the Panasonic UB900. It does have some very nice features, but the disc mechanism seems very clunky compared to the smoothness of the Oppo. How is disk handling in the UB820? Is it smooth, noisy, cumbersome, etc? Regarding the promised DV update, I learned my lesson with the Oppo and Sony DV upgraded sets. I will never, ever, again buy something or believe a future update until it actually occurs. It is beyond my comprehension why this player, which has been in development for some time, and with Panasonic having to be familiar with the Sony DV and Oppo debacle, wasn't released with full DV functionality. That alone completely turns me off to this machine and makes me very wary. If I'm wrong, please educate me. Thanks. This is different from the HDR slider we have now on the 900 correct? the tone mapping would be a good step up from that no? If it works for us, it would be a nice addition, yes. This would allow the player to adjust the HDR in real time to account for especially bright or dark scenes that clipping doesn't occur on either end of the spectrum. More detail in bright and dark scenes. This is different than the dynamic range slider we use right now with the ub900. However, I've read posts that said it doesn't work well with projectors, or perhaps only on bright scenes only. I'm look for verification on this before I consider buying. I was under the impression that the tone mapping on the oppo was one of its much better features vs. the ub900, which had it's own pro obviously, but the tone mapping was one area the oppo actually had it beat. My JVC is dialed in beautifully with my ub900 by Chad B (with two gamma settings to choose from), but the tone mapping is static as such. Perhaps out of the box, the Oppo is better, but not once it's well calibrated. The ub820 would make it dynamic by scene, which would be extra cool. I think. I'm not going to buy it if I hear a big "meh" over the Optimizer. My ub900 throws a beautiful HDR image with my JVC rs620. Do you even utilize the HDR slider since your PJ gamma was calibrated? I just sold my Phillips BDP7501 and pre-ordered the UB820. I'm expecting a world of difference with my Epson 5040ub due to never having had the HDR slider option before, never having and optimizer tone mapped at the source before, and never owned the premium Panasonic BD players before. Think I will see a big difference? There are different settings in the 820/9000 for HDR Optimizer from the demo YouTube videos out there. One of the settings specifically targets projectors. From initial impressions this should work unless your projector is just very poor at HDR or has a very dim bulb. I will see if I can post a screen shot. I just ordered mine from VE. Do you think this device will be worth it with my samsung q9fn 2018? Yes your TV has very good brightness for HDR and good contrast. This player should be a great match. That’s good to hear. My current player is bottle necking the capabilities of my TV that’s why I decided to get this one. What player do you have and what issues? It’s the samsung m8500. I have tried my friend’s ub900 and i can tell the diff when it comes to picture quality in general. Also the audio bec m8500 has only 1 hdmi output port. Ah yes. I had the 8500 for 24 hours and returned it. At the time there were issues with color accuracy and I thought even the Xbox S had a better picture. I would expect the 820 to be as good or better than thevUB900. Yes, I use it at +6 so I don't have to use high lamp power on my projector. If your projector is calibrated, the dynamic range slider makes a huge difference in the ub900, but it's static for tone mapping. The 820 supposedly allows it to be scene specific, which is intriguing if executed well for projectors. I love my UB900 with my JVC X570/RS420. I am really puzzled by the fact that it seems that Panasonic may not bring the new series to the USA. Have you heard any confirmation on whether it will be distributed here? With Oppo out of the picture it's Panasonics market to take, in my opinion. Answering to Garrett and Blafarm, no DV isn't active yet. On Netflix, DV content is recognized as normal HDR. So, it is impossible any test so far. A coming soon firmware update will introduce Dolby Vision on this player. I have a UB820 and an Epson LS10000 (with a HP 2.8 screen) and do SDR/BT2020. I find that the middle luminance setting (1000 nits) gives me more "punch in colors" and detail than the basic lcd/projector setting (500) nits. Coming from the UB700, I can say that the improvement from the HDR Optimizer is definitely noticable. I recently ordered the UB820. I currently have the UB900 and Oppo 203. My HT is a 100% blacked out velvet room, 142" 16:9 2.8HP + JVC RS600. I have calibration equipment and one of the first to confirm the Oppo tone mapping was stuck at R709. UB900 SDR/BT2020 did not have the same issues but the single slider was limited. I'm looking forward to comparing the more advanced features when it arrives and will post feedback in this thread. Nima, monkaquinas, atabea and 1 others like this. If you have any tools to measure, can you please measure the BT2020 color gamut while in the HDR optimizer (dynamic tone mapping) mode and confirm that it is, indeed, meeting this standard? Sorry no measuring equipment here but my Epson was professionally calibrated to BT2020 and I could not see a difference between the UB700 SDR/BT2020 and the UB820 SDR/BT2020. On the contrary what was shown in the video with the white pixels brightening the colors without HDR Optimizer seems to be true. Colors seem to look better with Optimizer engaged. @zombie10k I am looking forward to your results. Last edited by Nima; 07-20-2018 at 07:54 AM.